I'm a little numb sitting here at the computer on a Friday morning after a week, unlike any other in the "portrait painting" portion of my life. I have some finishing touches to do on Adam Wood's portrait, after which Deana is going to pop by to pick it up, along with the one of Marie, and hand deliver them to La Loche. 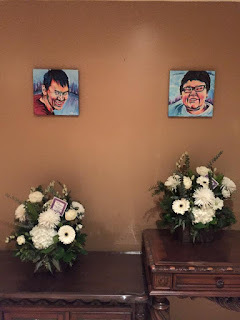 The portraits of Dayne and Drayden made their way to La Loche with Melissa, the brainchild of this project, on Wednesday and are now on the wall of their mother's home. To say that I have been overwhelmed by the response to these portraits would be the understatement of the year. I posted the shot of all four paintings shortly after 9 pm last night, within minutes it had been shared hundreds of times. The messages started pouring in immediately, personal and profound expressions of appreciation. I'm grateful for each one. I'm grateful to CBC English, CBC French, Saskatoon Star Phoenix, and Shaw Fort McMurray for helping to share this story. I'm grateful for everyone who embraced this project and its intention: to express our community's solidarity with one of our closest neighbours across the border. There are so many ties between the communities in Wood Buffalo and La Loche. Melissa Herman, originally from that community, wanted to do something special. I'm honoured that she thought of me and suggested that I paint Drayden, Dayne, Marie, and Adam. I don't know if this is the end of this journey, or if there is more to come. I keep looking at these four paintings together and thinking that they might further serve and support the families and the community of La Loche. The first thought is to find a sponsor to pay for the production of limited edition prints that could then be sold to raise money for a legacy of some kind. Or, maybe it's an installation in the school? I don't know. 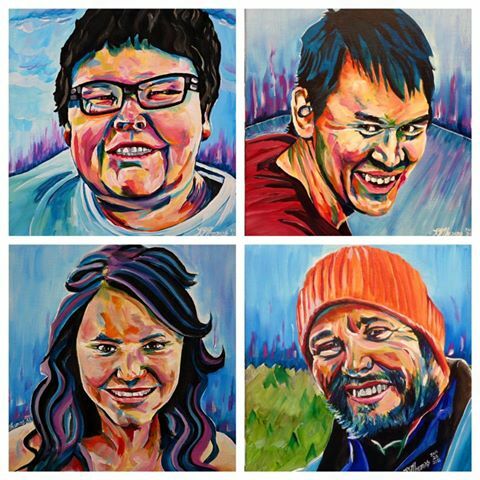 But the offer is there from my end, to leverage these works of art in ways that will support the community and honour the memories of Drayden, Dayne, Marie and Adam. It has been my honour to do this.